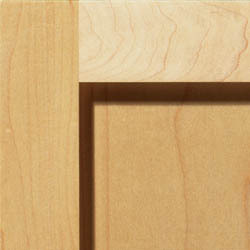 Recessed Panel doors are made of a plywood material covered with wood veneer and a solid lumber frame. Using a recessed panel provides a minimalistic look compared to a detailed raised panel and creates a door that is lighter in weight than a solid panel door. Though the wood veneer and the solid lumber typically come from the same wood species there can occasionally be a difference in appearance in color and/or grain between veneer and lumber.